When it comes to books and reading the best thing that happened to me last year was by far “The Shadow of the Wind” and the discovery of its author Carlos Ruiz Zafón. 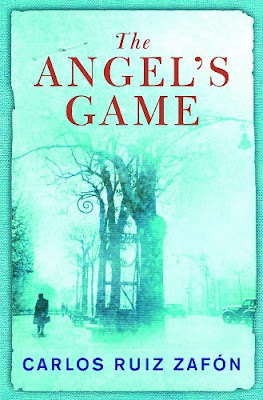 So, in a predictable course my most anticipated book for this year was another novel of the Spanish author, “The Angel’s Game”. “The Angel’s Game” is a prequel of “The Shadow of the Wind”, but pretty much can stand on its own too. For those familiar with “The Shadow of the Wind” this novel will present them familiar places, Barcelona as the main setting and the Cemetery of the Forgotten Books, characters such as Sempere, Isabella and Barceló and themes, love and friendship as main courses. But easily the novel sets itself apart too, bringing forth a new themes, confronting the personal demons, that of a personal price and that of the most known pact of all, characters as lovely and powerful as ever and places, like the mysterious and creepy mansion where the main character, David Martin, lives. For me once again the relationship with the Carlos Ruiz Zafón’s novel became a very personal and selfish one. With the help of the words inscribed in its pages I became indifferent to the outside world, isolating myself from the distractions offered by it and loosing myself completely in the story. Rarely does it happen to me not to be able to put a book down, even for a short while, or going to sleep only thinking of the next morning when I can pick up the reading where I left it. Carlos Ruiz Zafón doesn’t bring anything new in terms of themes, but the way he plays with the known ones may easily make the reader addictive to his works. The main character of the novel, David Martin, is helping his creator in building a strong story, but not only him. All the characters, major or minor ones, are very lively, making me truly feel their presence in the unfolding events of the story. Although some of them are only penned and have a passing performance still they contribute fully to the atmosphere and are not just cardboard decoration. In the center of all is, naturally, David Martin. A strong character, one of the strongest I’ve read, and with whom I am certain that every reader can find a thing to relate to. His relationships with other characters are wonderful things as well, especially the one with his assistant, Isabella, making me delighted by the resulted dialogues. Like in the Carlos Ruiz Zafón’s previous novel I read, “The Shadow of the Wind”, the main setting of the novel is the city of Barcelona and once again the author uncovers a city with which it shows a deeper connection. Throughout all the reading moments I felt that if I close my eyes I can see myself walking the streets of Barcelona in the 1920s, almost like a travel through time and space. There is also a connection between the city and the main character and in many occasions it will seem that the setting shifts accordingly to David Martin’s emotions. And all these disposition changes, of the character or city, will help create the atmosphere of the novel. An atmosphere which is darker and grittier than the one in the previous novel I read by Zafón, but which makes its contribution to the mystery of the story. I can’t honestly say that I enjoyed more “The Angel’s Game” than “The Shadow of the Wind”, but the fact that reading it with high expectations set by “The Shadow of the Wind” and all of them being fulfilled didn’t came as a surprise must have a role in my opinion. For certain though “The Angel’s Game” is the best book I read this year and the way Carlos Ruiz Zafón plays with emotions and the way he crafts his stories made me fall in love with his works. I just wonder what Carlos Ruiz Zafón has in store for me next? I discovered that the "Shadow of the Wind" was translated in Bulgarian, so I ordered it straight away. I can't wait for it to come. I hope you'll read it soon, because it is a great book. Harry, I read "The Shadow of the Wind" in Romanian. I've asked the Romanian publisher about "The Angel's Game" and they said that it will be available at the beginning of this year. Sadly it was not and I don't see any perspective for the moment either. I am happy to see that after all I see books I want to read in Bulgarian and at really nice prices. I hate to read in Bulgarian, because the English has a certain charm at often gets lost due to clumsy translation. Great review Mihai! But I must admit I liked "The Shadow of the Wind" more than "The Angel's Game". Don't get me wrong "The Angel's Game is an extraordinary good book. But for me there are more magic moments in "The Shadow of the Wind". I read both books in English. I had a look at the German edition but I didn't like it. As Harry wrote, during translation charm gets lost. As for translation I was thrilled by the one in Romanian for "The Shadow of the Wind". Especially since the languages are very close to each other. I hope that "The Angel's Game" will be translated too and then I'll certainly like to see how the Romanian translation will look like. Another great review, Mihai. I love the premise and this will be going on my special list for December. Nice post. It shows how rich could a literature be in terms of translation.Through translating shows the rich blend of knowledge and culture in a society.Whether in Romanian translation or in any foreign language translation helps one to get acquainted with the thoughts, traditions, principles and actions of the people from the region. Very nice post,thanks to sharing.